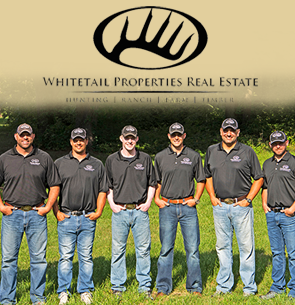 Whitetail Properties Real Estate LLC is not your average real estate company. The company was created for the sole purpose of bringing together buyers and sellers of hunting, ranch and farmland. The Whitetail Properties team covers more than 26 states and is made up of many of the finest land managers and market analysts in the rural real estate industry. They call their agents “land specialists” and they are just like you. They love to hunt. They love the land. In the last two years, the Whitetail Properties Minnesota team of Land Specialists has completed 347 land sales transactions, comprising nearly 28,000 acres and totaling $110,000,000. They sell a property in Minnesota every 2 days. Whitetail Properties Land Specialists challenge the status quo through their unrivaled passion for land, their unmatched qualification in the rural real estate business, and by holding themselves to the highest standard possible. They understand that buying or selling a piece of land is most likely the largest financial transaction you will make in your life. Those qualifications include the completion of the QDMA Deer Steward Level 1 & 2 courses, giving them a vast knowledge of wildlife and habitat management practices. They have helped clients all throughout Minnesota in putting these practices to use on their property to improve whitetail habitat. Within the Minnesota team are also Accredited Land Consultants who have completed over 100 hours of course work through the Realtors Land Institute.